With a "no deal" Brexit still possible alongside the decision by the UK parliament needing an extension of Article 50, the damaging impact of Brexit uncertainty will continue. 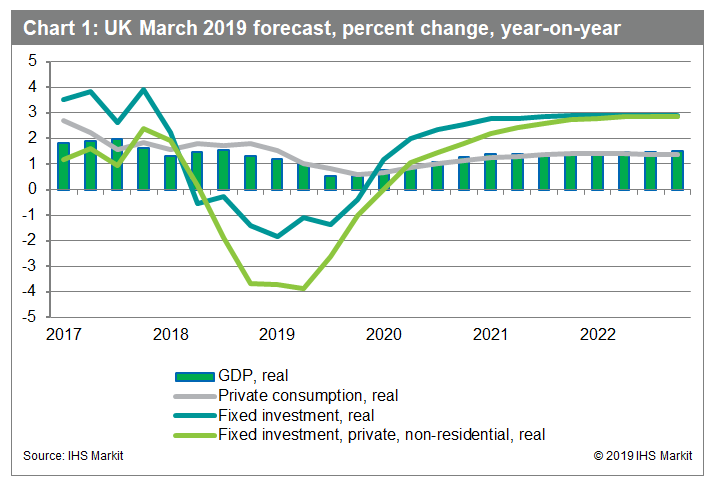 Our current assessment is that the UK economy will be close to stagnation during the first half of this year (see chart 1) and expand moderately in 2019-20. On 29 March, UK Prime Minister Theresa May's EU Withdrawal Agreement was voted down for a third time by parliament. The 12 April is now the next possible date for a no-deal Brexit to take effect. To avoid that and potentially reach an agreement with the EU to extend the Article 50 process deeper into 2019 or beyond, UK political parties must present a compromise position to the EU. Non-binding indicative votes in parliament have failed to deliver a majority for an alternative Brexit path, but there appeared some movement towards potentially a softer Brexit. Under any circumstances, the EU is unlikely to grant a longer extension unless the UK agrees by 12 April to participate in EU elections in late May. Business groups are not impressed. The Institute of Directors note "we are running out of words to express how sick business leaders are of being stuck in this spirit-sapping limbo. The inability to make any decision is doing lasting damage to enterprise." With a "no deal" Brexit still possible alongside the decision by the UK parliament needing an extension of Article 50, the damaging impact of Brexit uncertainty is likely to linger. Continued squeeze on industrial investment plans. Brexit malaise increasingly affecting the service sector. Less supportive labor market conditions. 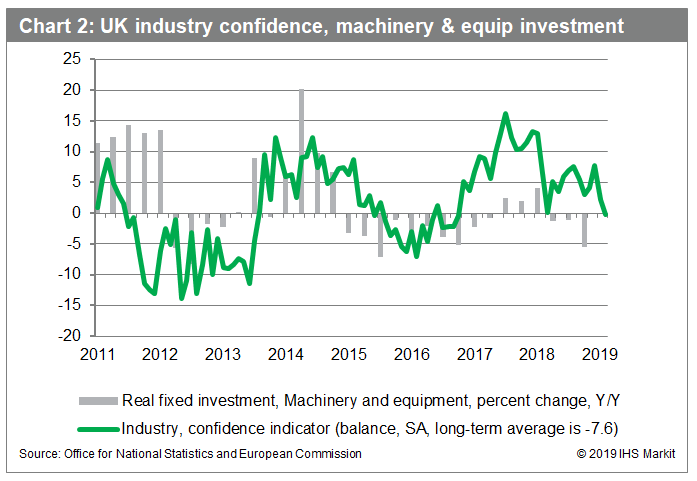 Fixed investment rose by just 0.2% in 2018, the weakest performance since the financial crisis in 2009, triggered by shrinking business investment (predominately machinery and equipment, see chart 2). Latest survey data signal further disruption to business investment intentions during 2019. The quarterly IHS Markit UK Business Outlook survey conducted early 2019 report that private sector firms are the least optimistic about their prospects for growth in next 12 months since the series was launched in 2009, with a net balance of 28% firms anticipating an increase in activity. Also, a net balance of 3% of private sector firms expects to invest in the next 12 months, a near-seven-year low. A trade agreement is challenging, suggesting that UK firms will remain uncertain for some time about their future trading arrangements with the EU. Some economic losses from any trade deal are likely when compared to UK remaining a full member of the EU. Any future trade agreements could fall short of the "frictionless arrangements" that the UK currently enjoys as part of the customs union and single market. The principle of equivalence for the trade in services in general represents some risk to UK exports of services to the EU and can be withdrawn at short notice. Negotiating close ties in the key areas of trade in goods, customs union, services, and regulations faces obstacles. The EU is likely to take account of how closely aligned the UK is to its goods rules when applying regulatory checks, its normal approach to trade deals. Any future trade deal between the EU and UK could place the latter in the position of being a "rule taker" from Brussels, conflicting with the key Brexit goal of delivering increased UK sovereignty. 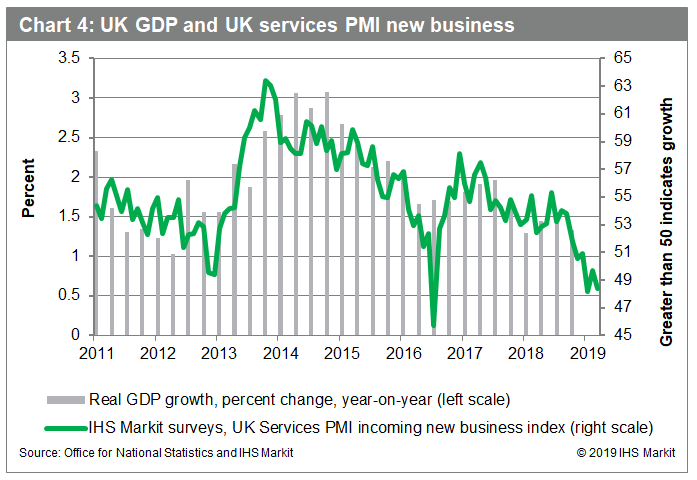 Meanwhile, IHS Markit CIPS UK services PMI signals that business activity softened in early 2019, triggered by retreating new orders. 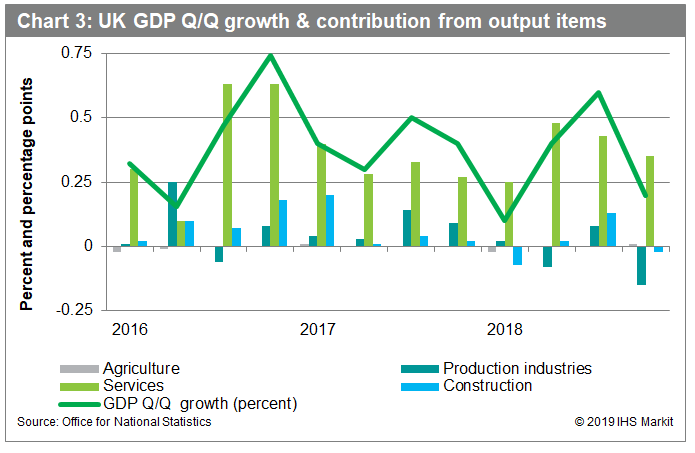 Indeed, chart 4 displaying contracting new business suggests the growth contribution from service sector activity is likely to recede during 2019-20. The sector has been the mainstay of the economy since the June 2016 referendum (see chart 3). Service providers report Brexit-related concerns are damaging the inflow of new business, leading to more cautious investment and employment decisions. 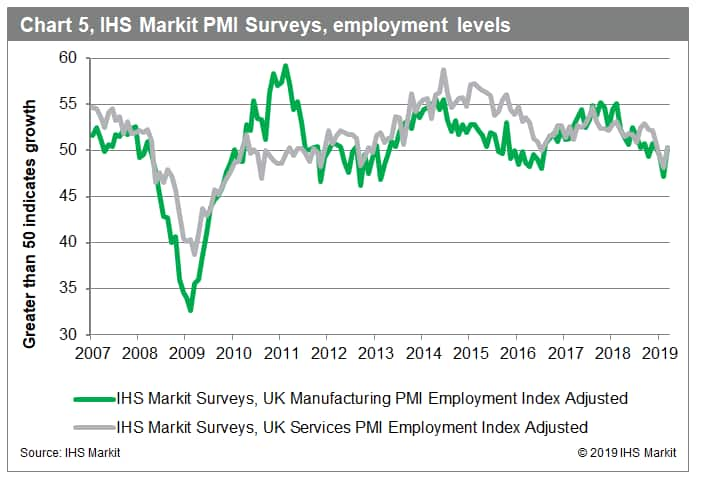 Brexit uncertainty and deepening business gloom failed to disrupt the "jobs miracle" during 2018, with many firms appearing to be at ease recruiting additional labor than investing in machinery and equipment to meet any additional demand in the current uncertain climate. However, manufacturers and service providers are leaning towards more cautious recruitment plans (see chart 5) due to subdued demand and concerns about the economic outlook.